This PhET "Gold Star Winner" is a four-week instructional unit on the topic of Waves, created by a high school teacher. It was designed to be used with interactive simulations developed by PhET, the Physics Education Technology project. 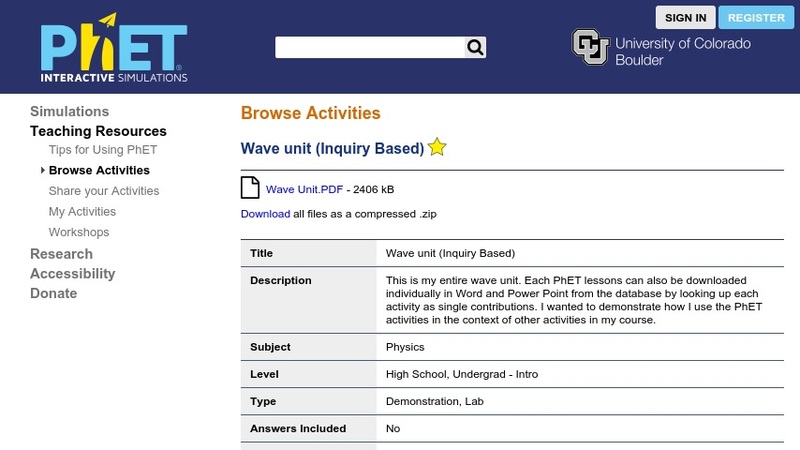 Included are detailed lessons for integrating labs, simulations, demonstrations, and concept questions to introduce students to properties and behaviors of waves. Specific topics include frequency and wavelength, sound, the wave nature of light, geometric optics, resonance, wave interference, Doppler Effect, refraction, thin lenses, wave addition, and more. Editor's Note: This classroom-tested resource could be of great value in meeting expanded national standards on wave energy. In one package, it brings together lessons, "clicker" or warm-up questions, digital media, hands-on activities, and unit reviews with answer keys. It can be easily condensed and adapted to a range of course levels from physical science to AP physics.